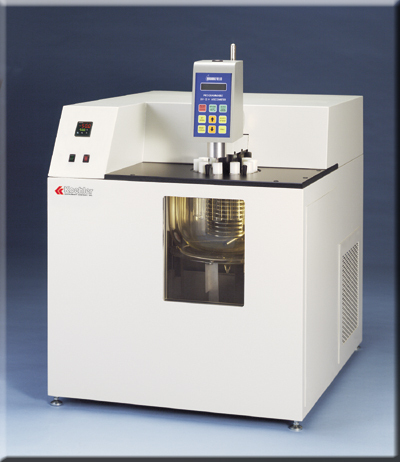 Determines the low temperature, low shear rate viscosities of gear oils, automatic transmission fluids, hydraulic oils and other fluid lubricants by use of the Brookfield viscometer. Constant temperature liquid bath permits testing of samples without the risk of sample temperature rise. After cooling in the air bath, the sample must be transferred to the balsa cell carrier for testing with the Brookfield viscometer. If the sample is not tested quickly, there is the risk of sample temperature rise. The Brookfield Viscosity Liquid Bath eliminates this risk by permitting the sample to be tested in a constant temperature environment. The Brookfield viscometer mounts directly on the bath and the samples are rotated into position under the spindle by means of a built-in turntable. Cooling system maintains temperature with ±0.05°C stability in the range of +10°C to –55°C. Bath temperature is displayed in digital format.